Happy monday and welcome to another week of #ThatBusinessShow with Jamie Meloni on #1250whnz every weekday at 8am! You can hear our show live at #1250whnz or listen to all of the shows on demand at http://www.tampabayradio.com, or watch the live video at my YouTube channel on http://www.youtube.com/jamiemeloni. Today marks the nearly 2 year anniversary of #ThatBusinessShow! Discussing that with me was our lovely co-host, Stella Guidicelli. Stella insists that we have a party so we will keep you all updated on that! Opening the show, me and Stella have a bit of chit chat before the first segment with Travis Godwin with Shankman Leone Attorneys. On the second segment of the show, we had with us Wendy Bernhard, Property Manager with My Salon Suite. #ThatBusinessShow with Jamie Meloni opening up another great day! Make sure to tune into the show on #1250whnz! Remember that you can listen to all of our shows at http://www.tampabayradio.com! With us on the first segment was Travis Godwin, an attorney with Shankman Leone Attorneys. Travis has many years of experience with county, state, and even federal courts. Discussing the legal intricacies of owning a business correctly, Travis described Shankman Leone attorneys as a firm that, “can take your business from genesis to destruction.” With a description like that, I would hate to be on the opposite side of them! Travis discussed with us the new tax regulations and adjustments that homeowners are already getting in their mailboxes and what to expect in the future. He also spoke with us about the entrepreneurial side of things, telling us how businesses often fail due to faulty paperwork made in the beginning stages of the company. He told us of an example where partners were very engaged in the business, but after time they broke up and the business went under because the proper separation arrangements weren’t in place. 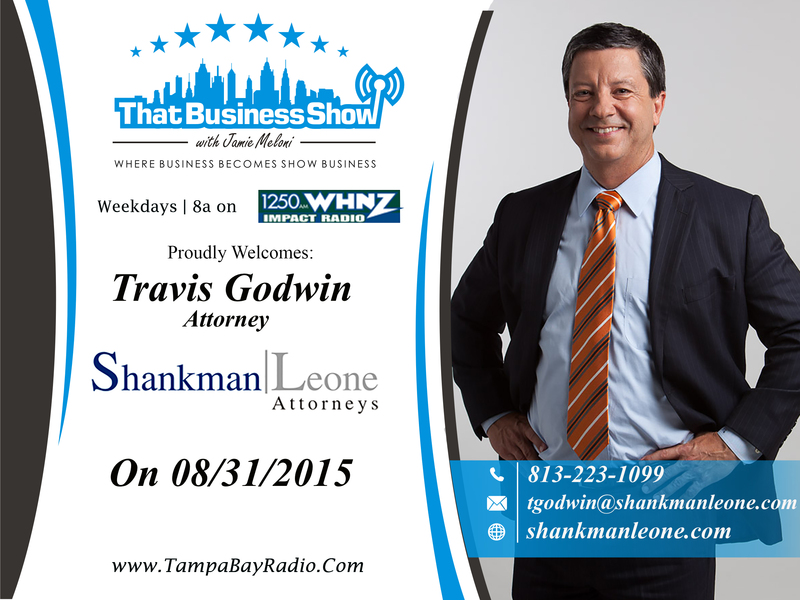 You can learn more about Travis and Shankman Leone Attorneys at 813-223-1099 or email him at tgodwin@shankmanleone.com. Visit his website at http://www.shankmanleone.com! He offered us many great tips and you can catch them all on #ThatBusinessShow with Jamie Meloni. If you missed the episode, check out http://www.tampabayradio.com to listen to them all on demand! 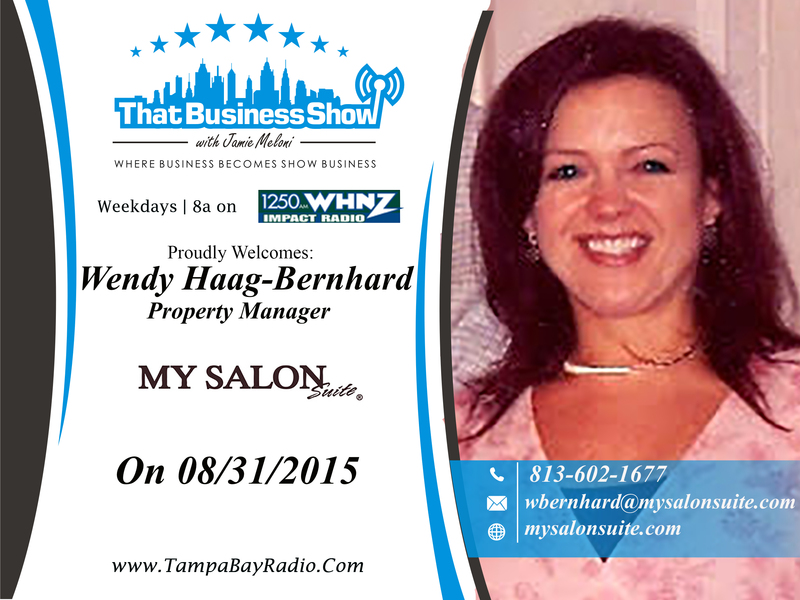 Coming on the second segment was Wendy Bernhard, Property Manager with My Salon Suite. Wendy is a true entrepreneur, working for 15 years in the corporate scheme and deciding that she wanted to be her own boss! That’s what we love here on #ThatBusinessShow, people who strive to make their lives better through entrepreneurship! She described to us how My Salon Suite isn’t your usual salon, that individual salon professionals can have their own fully stocked spaces and essentially be their own bosses! For the salon professionals, My Salon Suite offers them a chance to have the “freedom, flexibility, and control” that many entrepreneurs seek! And for the customer, My Salon Suite offers a unique experience, being in a more private and comfortable are, and giving the customer access from everything from hair coloring all the way to Botox under one roof! At their Palm harbor location there is an open house for the public on October 19th! Check that out and Learn more about Wendy and My Salon Suite at 813-602-1677 or email her at wbernhard@mysalonsuite.com. Visit their site at http://www.mysalonsuite.com! Happy Friday everyone! Another excellent week here for #ThatBusinessShow with your host, Jamie Meloni! Today we had a great show, my lovely Co-Host Stella Giudicelli coming on once again! We also had three great guests. 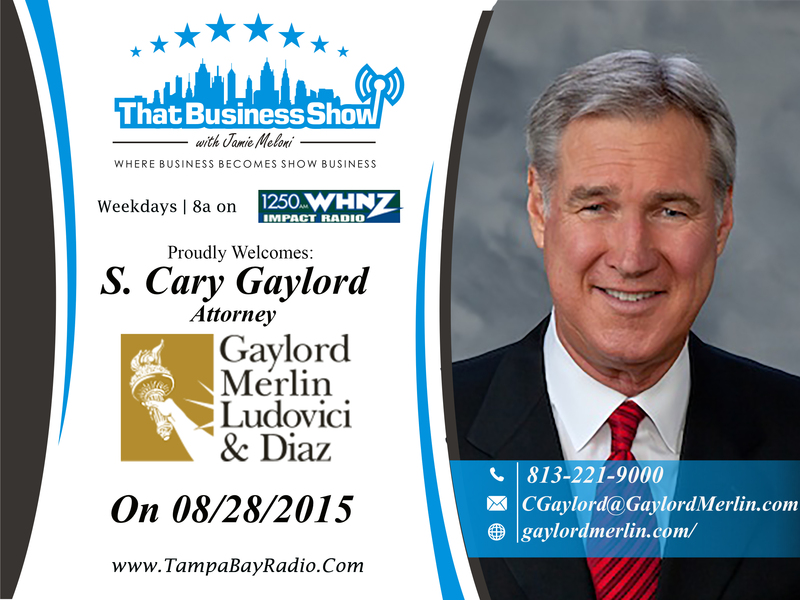 On our first segment was Lorena Hart Ludovici and Cary Gaylord, attorneys with Gaylord Merlin Ludovici & Diaz. Our last guest was Lisa Koche, Medical director with Sprectra Wellness Solutions. We had great content on the show today, and as always thank you for tuning into #ThatBusinessShow with Jamie Meloni on #1250whnz every weekday at 8am. 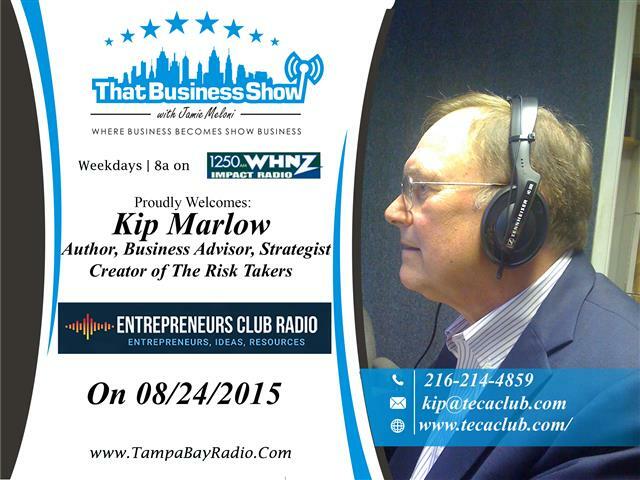 On http://www.tampabayradio.com, we have the show up to listen on demand, and we have a list of all our past guests on there available, as we’ve had a multitude of guests with many different business backgrounds, making #ThatBusinessShow a great tool to get in touch with entrepreneurs in the Tampa Bay area. On our first segment on #ThatBusinessShow with Jamie Meloni, we had Lorena Hart Ludovici, an attourney with Gaylord Merlin Ludovici & Diaz. Since 2012, Ms. Ludovici has served as Vice Chairman of the Eminent Domain Committee for the Florida Bar. Ms. Ludovici was recognized by Florida Trend Magazine’s “Florida’s Legal Elite”, making her quite the force to be reckoned with! Also from Gaylord Merlin Ludovici & Diaz was Cary Gaylord. Cary was also recognized in the “Best Lawyers in America” publication! Mr. Gaylord is a member of the Hillsborough County, Florida and American Bar Associations and is active in the Eminent Domain Committees of the Florida Bar and the Hillsborough County Bar Associations. The two are certainly professionals at what they do! They discussed with us exactly what eminent domain is, and what people’s options are when the government comes to take their land. They discussed with us a few stories of their successful clients, and one that was not too happy with his settlement… and decided to pull out a shotgun! Needless to say the cops were involved! 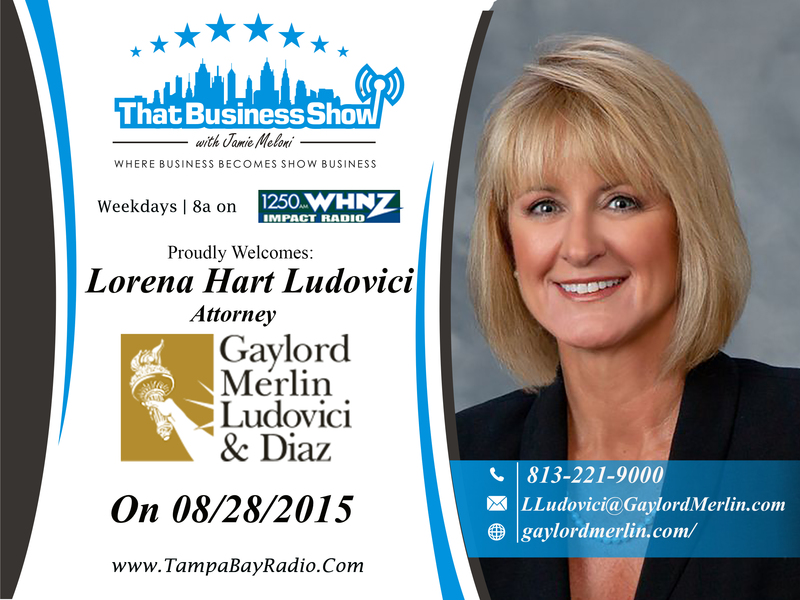 An excellent segment of #ThatBusinessShow with Lorena Hart Ludovici and Cary Gaylord with Gaylord Merlin Ludovici & Diaz! You can contact Lorena at LLudovici@gaylordmerlin.com. Also you can contact Cary at CGaylord@gaylordmerlin.com. You can visit their site and learn more at http://www.gaylordmerlin.com. 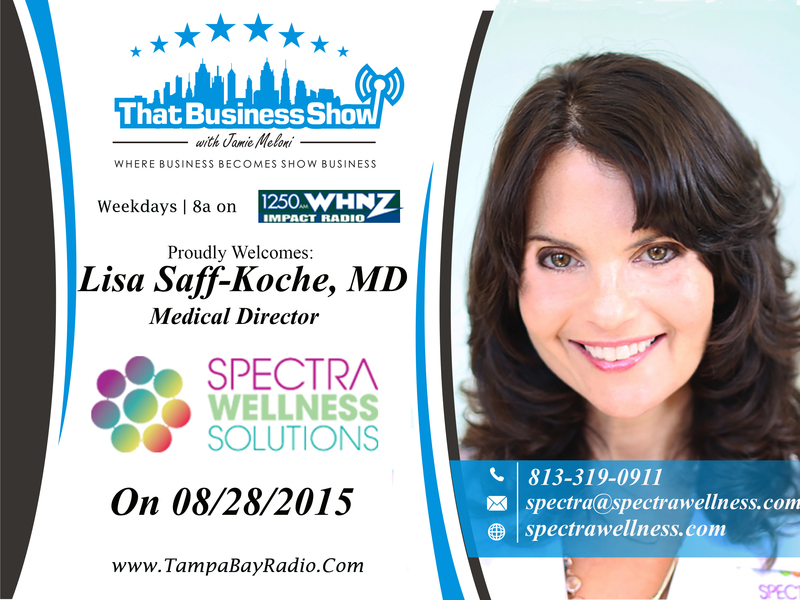 Our last guest was Lisa Koche, Medical director with Sprectra Wellness Solutions. Her practice, Spectra Wellness Solutions located in South Tampa, uses cutting edge methods and is dedicated to utilizing the best of both traditional and integrative medicine. Lisa works with a team of gifted healers to create individualized treatment plans for her patients and has created a signature program, the Koche Approach, which is a 12- week comprehensive course to get patients optimally functioning on all levels. Lisa spoke to us about how she started in the integrative health field, and about her new program. She discussed with us the differences between traditional medicine and integrative medicine. Lisa informed us of the ketogenic diet and how athletes and others use that to have higher amounts of energy and have their bodies run on fat instead of carbohydrates, losing tremendous amounts of body fat! You can contact Lisa Koche at info@spectrawellnesssolutions.com or at 813-319-0911. You can visit her site at http://www.spectrawellness.com. Welcome to yet again another episode of #ThatBusinessShow with Jamie Meloni on 1250whnz, every weekday at 8am! If you missed our 8am show, you can find all the shows and more at http://www.tampabayradio.com or at my YouTube channel at http://www.youtube.com/jamiemeloni. 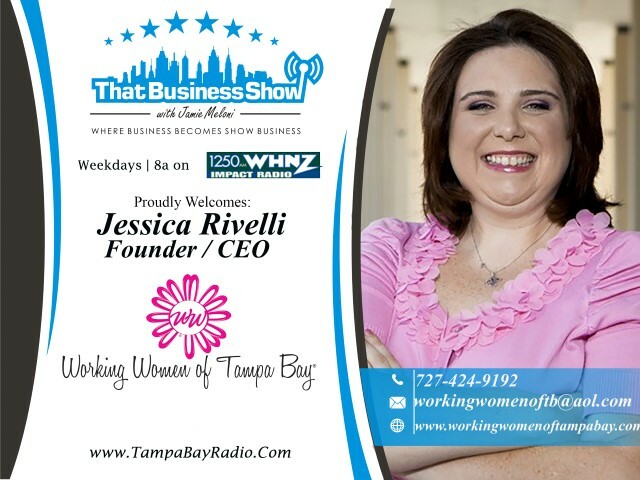 Today on #ThatBusinessShow, we had Jessica Rivelli from Working Women Of Tampa Bay, as it is #WorkingWomenWednesday! We also had Monica Leonard form Molly’s Suds come on and tell us about harmful chemicals in household products and why Molly’s Suds different as they use all natural, simple ingredients! Our last guest was Renee Dabbs, Founder of We Will Tampa; a firm that helps women begin to engage in politics and leadership positions. We had a great show today and remember that if you missed out on the live session, you can check out any of our shows and see more information on our guests at http://www.tampabayradio.com, or see the video on my YouTube channel at http://www.youtube.com/jamiemeloni. It’s our favorite day of the week on #ThatBusinessShow, #WorkingWomenWednesdays! With us today was Jessica Rivelli from Working Women Of Tampa Bay, a company dedicated to furthering women in our community, and bringing women together to learn the valuable skills it takes to be a successful entrepreneur, or even run for political office! She spoke to us about her 1000th event with Working Women Of Tampa Bay, of which you can find out more at http://www.workingwomenoftampabay.com! The Working Women Conference is also coming up! So check that out and purchase tickets using the special promo code Meloni2015 at http://www.workingwomenconference.com! 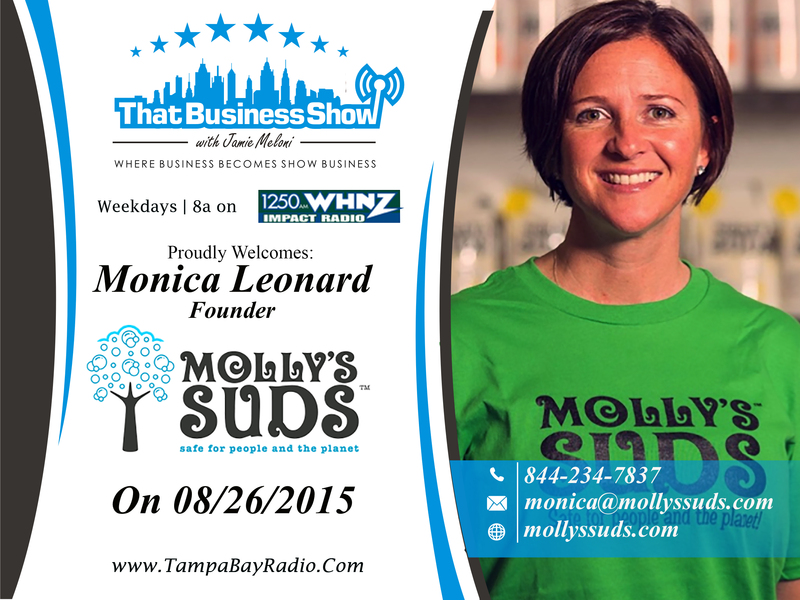 Our second guest today on #ThatBusinessShow with Jamie Meloni was Monica Leonard with Molly’s Suds! Molly’s Suds is a line of truly safe household products. Monica has a passion for teaching and motivating others to be wise and do their research before simply accepting and trusting the ingredient integrity of many of today’s brands on the market. She spoke with us about some pretty shocking stuff, about how there are over 300 chemicals found in household cleaners like laundry detergents that are absorbed into the body and are found in breast milk, blood, and in cancerous tumors! Molly’s Suds offers people a completely safe alternative to the huge brands that have harsh and dangerous chemicals. Molly’s Suds are available at many natural oriented stores nationwide, and also at http://www.mollyssuds.com! You can contact Monica Leonard at 844-234-SUDS, or at monica@mollyssuds.com. 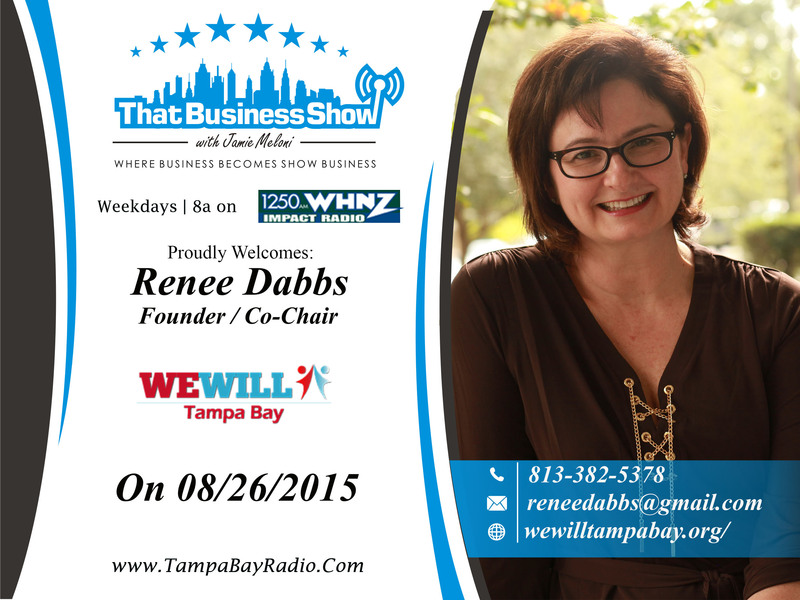 Our last guest was Renee Dabbs, Founder and Co-Chair of We Will Tampa Bay. Renee is dedicated to bringing women together in a collaborative spirit to further their political careers, and give them the tools to be successful leaders in the community. With many years of experience in the political scheme, she offers women valuable advice, and coaches them on the skills they need to be successful in the business world. We Will Tampa Bay has a Symposium for women coming up! It is a non partisan event focused on gathering like minded women to help teach each other leadership skills and help plan routes for success! The Symposium will be October 2nd at the Mainsail Conference Center, and you can find out more about this event and purchase tickets at http://www.wewilltampabay.org! Thanks for tuning into another episode of #ThatBusinessShow with Jamie Meloni, every weekday at 8am on 1250whnz, or available anytime athttp://www.tampabayradio.com or on my YouTube channel athttp://www.youtube.com/jamiemeloni. Thank you again for tuning into another great episode of #ThatBusinessShow with me, your host – Jamie Meloni. #ThatBusinessShow is on 1250whnz every weekday at 8am, or is available on demand at http://www.tampabayradio.com or at my YouTube channel at http://www.youtube.com/jamiemeloni! Today we had quite the lineup, with Anthony Diaz coming on the first segment to talk to us about Health Hero, a company that offers wellness programs for employees of businesses in order to save on healthcare costs. We also had Jeff Chernoff, Vice president of Insurance And Trust. Our last guest was James Chittenden, CEO and President of Triumph Business Services, and he gave us a lot of great advice for starting entrepreneurs out there! Catch all of the wonderful guests at http://www.tampabayradio.com, where you can also view all of our many past guests. 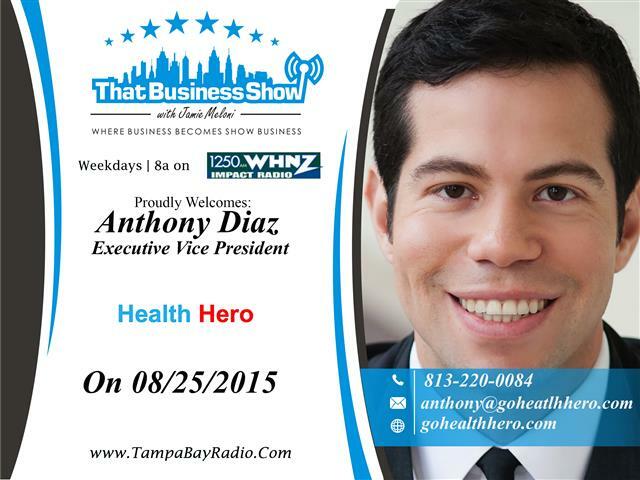 First up on the show was Anthony Diaz, Executive Vice President of Health Hero. Health Hero is a wellness program that makes healthier and happier employees of their clients. Their goal is to eventually have less insurance costs for a company due to having their employees make better health decisions, and even having them do exercises through their app, available at www.gohealthhero.com/. Anthony spoke to us on how Health Hero prides themselves on making a better work environment through happier employees. He told us simply, that if employees are taking care of themselves, they will need less medical attention in the first place, which is why preventative medicine is the way to go. Therefore, saving the company healthcare costs in the future! You can find out more about Health Hero at www.gohealthhero.com/, or you can contact Anthony Diaz at 813-220-0084 or at anthony@gohealthhero.com. Our second guest was Jeff Chernoff, Vice president of Insurance And Trust, a 3rd generation company focused on providing package policies for individuals and families, life insurance, disability income and long term care. He gave our listeners the inside scoop on why “15 minutes can save you 15%” is actually a terrible idea, discussing with us that cutting those corners leaves you unprotected in some pretty dangerous areas. As an insurance expert, he told us that insurance is very complex, and that to get the best deal possible for the least amount of money, an umbrella policy is, in his opinion – the wisest choice. He also elaborated on life insurance, and how there is no better time than the present to set it up. Jeff says that the difference between Insurance And Trust and the other guys is that he is able to personally go and listen to the needs of his customer and give them the help that they need as opposed to the big automated companies. 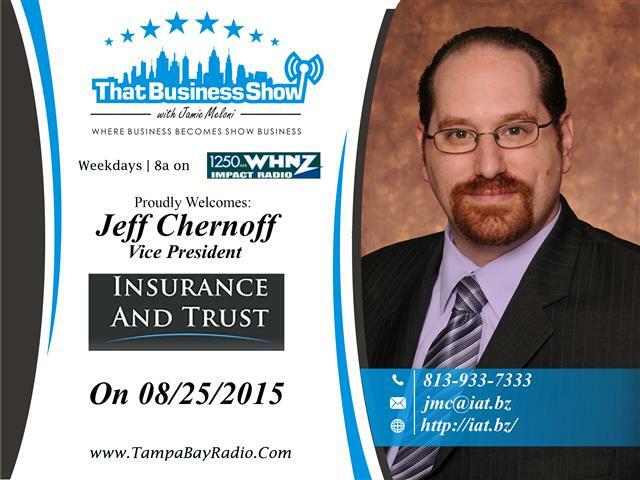 You can find out more about Jeff Chernoff and Insurance And Trust at http://www.iat.bz/ or contact him with any questions at 813-933-7333 or at jmc@iat.bz. 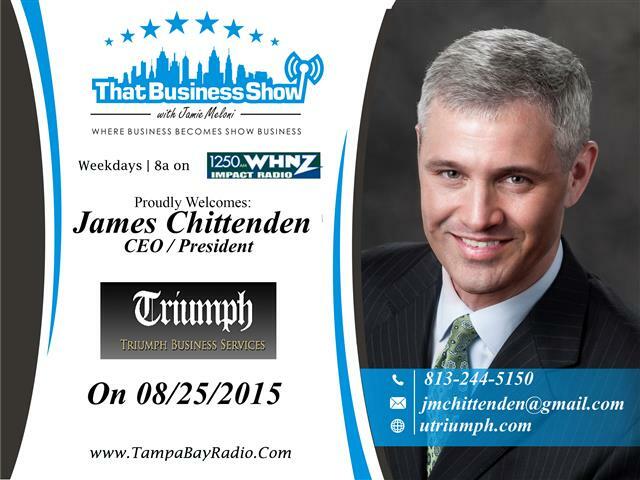 Our last guest was James Chittenden, CEO and President of Triumph Business Services. James Chittenden, a former Marine Corps Officer, founded Triumph Business Services to fill a variety of business needs. Primarily, Triumph Business Services helps entrepreneurs through a critical and challenging time; the actual start of the business. James is an experienced business banker and financial adviser. He has helped businesses and tradespeople of all kinds, and in every stage of their businesses to obtain financing regardless of economic conditions. He gave us some great advice, including how small business owners can get consulting for free at the Small Business Development Center. He says that the trend over the years of his experiences are that small businesses need to better connect with their resources in order to succeed. You can contact him with any questions at 813-244-5150, or visit his site at http://www.utriumph.com. As always, thank you for tuning into another great episode of #ThatBusinessShow with Jamie Meloni, every weekday at 8am on 1250whnz, or available anytime at http://www.tampabayradio.com or on my YouTube channel at http://www.youtube.com/jamiemeloni. Happy Monday, thanks for tuning into #ThatBusinessShow with Jamie Meloni on #1250whnz every weekday at 8am. If you missed our show on #1250whnz, you can hear any show on demand at http://www.tampabayradio.com. There you can see links to our live videos at http://www.youtube.com/jamiemeloni, and see all of our guests that have come on the show as we’ve had a multitude of people with different fields of practice; and you can find pretty much any service you need! Today on the show we had on Kip Marlow from Marlow Surgical Technology, Ed Suyak from Doctor’s Life Magazine and founder and managing director of Mashed Media Group, and Deepa Verma with Synergistiq Integrative Health; making today’s show quite health oriented. 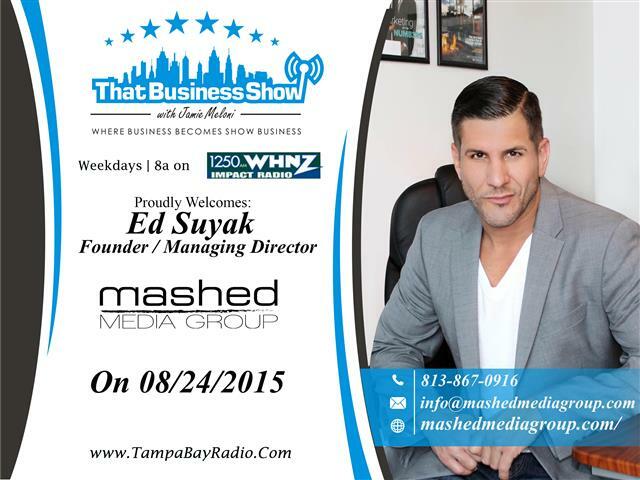 Our second guest was Ed Suyak, founder and managing director of Mashed Media Group. He is also the group publisher form Doctor’s Life and Remodel Tampa Bay Magazine. Ed is a leading expert in creating and publishing custom and niche publications from concept to completion. His 15 plus years in media publishing and media sales has provided him experience in a wide variety of publication genres. He spoke to us about Mashed Media Group, how it was started and what they do; and told us about his many different publications including Doctor’s Life, and Remodel Tampa Bay. You can check out Ed and all of his works at mashedmediagroup.com or at 813-867-0916. 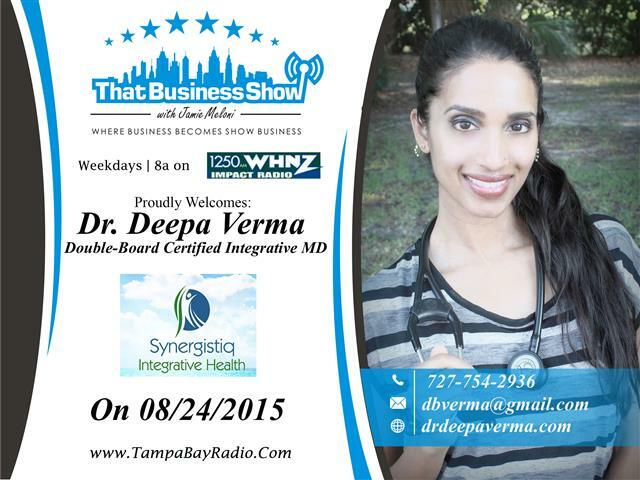 Our last guest was Deepa Verma, a Double Board Certified Integrative MD with Synergistiq Integrative Health. Deepa discussed with us the difference of integrative medicine and regular preventative medicine. She told us why her practice is so special, and gave us some examples of new cutting edge technology that she uses to keep her patients healthy and in good physical condition. She told us about her passion for keeping her patients and the community happy and healthy, spending time to actually get to know them; therefore improving the quality of medicine. Contact Deepa and learn more about her practice at http://www.drdeepaverma.com or contact her at 727-754-2936 or at dbverma@gmail.com. Thank you for joining us for yet another episode of #ThatBusinessShow with Jamie Meloni on #1250whnz at 8am. All shows are available on demand at http://www.tampabayradio.com, or look up the show on soundcloud! Follow me on many social media sites for more news for the show and the inside scoop on our guests!